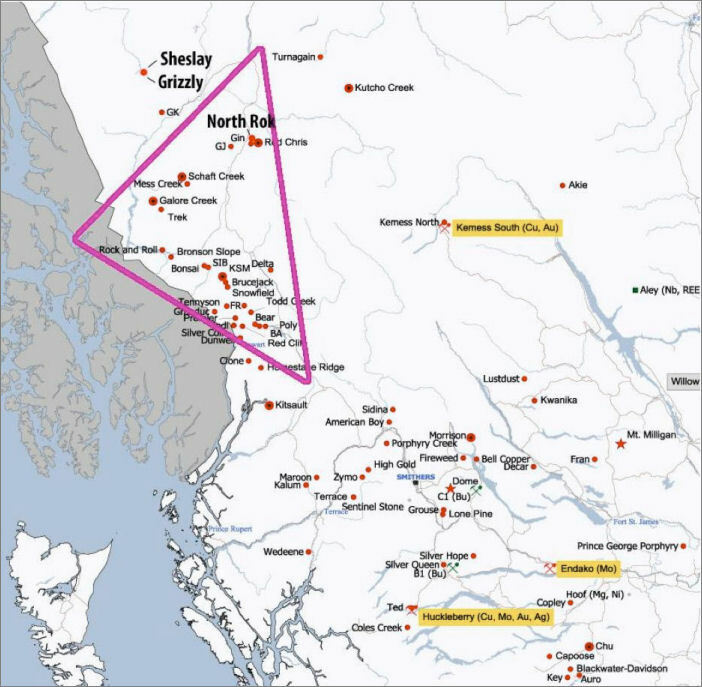 One of the biggest plays this year in junior mining is going to be seen in the Golden Triangle area of northen British Columbia. Due to harsh winters and lots of snowfall, the only time you can actually do any kind of field work is from about June onward and work until the end of October when winter sets in again. So in reality any miners hopeing to get anything done have only about four months to do their work. Last year there was some phenominal results that were drilled and a few of the main players saw their stock prices explode. Garibaldi Resources GGI saw it's stock price go from 12 cents to over 5 dollars. Metallis Resources MTS shares went form 15 cents to almost 3 dollars and GT Gold GTT shares shot up from 30 cents to almost 3 dollars. There were also several small players whose shares were under a nickle and and did easy doubles or triples just on news that they were going to be involved in one way or another in the triangle. After impressive grade results started to flow into the market place, this started to create a rush and before long there all the available properties were optioned out, bought out or joint ventured. It's quite typical on any kind of rush and the next thing you know is there are dozen of companies out trying to raise a few dollars to start some kind of field prospecting. Some of the early birds with actual results get attention from resource funds and find themselves well financed for the next round of drilling. This is what happened last year after results from Garibaldi and Metallis started coming in. Sprott funds started to invest heavily in both of these companies send ign stock prices even higher. Over the winter months companies were busy attending investment and resource shows around the world trying to get as many eyes on their projects as possible as well as searching over maps and any kind of geo data to find potential target spots for sampling, trenching or drilling. Raising money during the winter is one of the biggest jobs these junior have. No money, no drilling. Of course the big three, Garibaldi, Metallis and GT Gold are well cashed up and ready to get drills any day. Garibaldi issued news a few weeks back stating they would have drills turning first of June. The other players are mobilizing equipment and men a drills should be turning by mid June on most projects. Just today GT Gold issued news stating crew being mobilized and initial drilling with two rigs will simultaneously step out west and east of the high-grade near-surface gold zone defined at Saddle South through abundant multigram intercepts last summer including 51.53 grams per tonne gold over 6.95 metres, 14.75 g/t Au over 12.15 meters and 20.02 g/t Au over 8.25 meters. Keep an eye on the stock prices of these major three juniors and that will dictate a lot of sentiment in this market play.